Sergei Kuznetsov is one of the top experts on measure valued branching processes (also known as "superprocesses") and their connection to nonlinear partial differential operators. His research interests range from stochastic processes and partial differential equations to mathematical statistics, time series analysis and statistical software; he has over 90 papers published in international research journals. His most well known contribution to probability theory is the "Kuznetsov-measure." A conference honoring his 60th birthday has been organized at Boulder, Colorado in the summer of 2010, with the participation of Sergei Kuznetsov's mentor and major co-author, Eugene Dynkin. 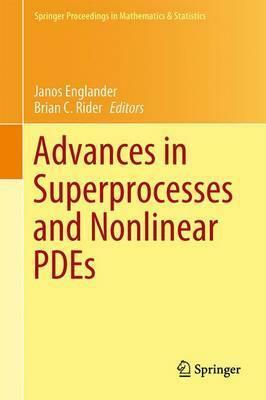 The conference focused on topics related to superprocesses, branching diffusions and nonlinear partial differential equations. In particular, connections to the so-called "Kuznetsov-measure" were emphasized. Illustrations note X, 126 p.
Sergei Kuznetsov is one of the top experts on measure valued branching processes (also known as "superprocesses") and their connection to nonlinear partial diﬀerential operators. His research interests range from stochastic processes and partial diﬀerential equations to mathematical statistics, time series analysis and statistical software; he has over 90 papers published in international research journals. His most well known contribution to probability theory is the "Kuznetsov-measure." Markov processes and their applications to partial differential equations Kuznetsov's contributions.- Stochastic equations on projective systems of groups.- Modeling competition between two influenza strains.- Asymptotic Results for Near Critical Bienaym\'e-Galton-Watson and Catalyst-Reactant Branching Processes.- Some path large deviation results for a branching diffusion.- Longtime Behavior for Mutually Catalytic Branching.- Super-Brownian motion: Lp-convergence of martingales through the pathwise spine decomposition.